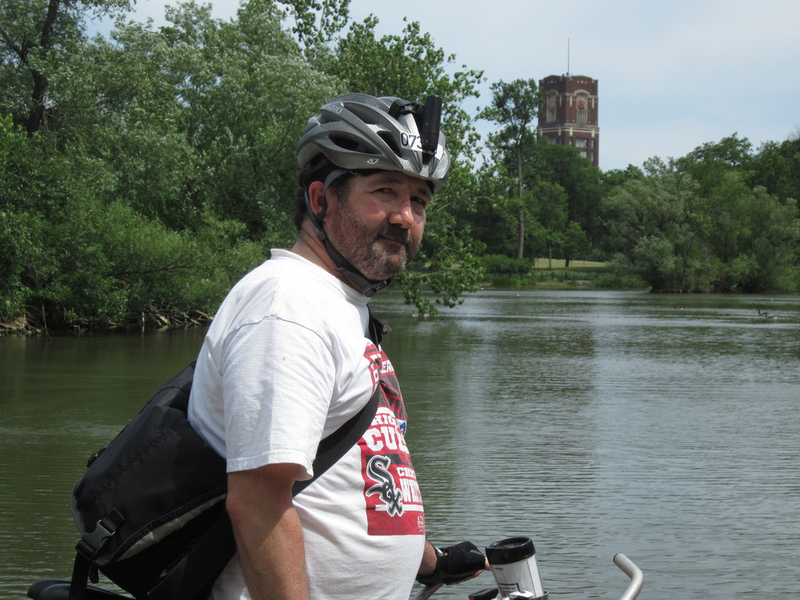 With that in mind, Bill’s invited me to join him on the roughly twenty-five-mile bike commute he does every week or so from his girlfriend’s house in suburban Evergreen Park back to Rogers Park. This epic ride crosses the entire city from the southwest corner to the northeast, and he’s devised a mostly backstreet route linking many of his favorite parks and historic landmarks. “It makes it a mile or two longer, but it’s much more pleasurable this way,” he explains. We meet up at Metra’s Beverly Hills-91st Street station on a scorching Memorial Day Monday. Pedaling west a mile on 91st takes us into Evergreen Park, a town of about 25,000 that’s the hometown of “Cheers” star George Wendt and Unabomber Ted Kaczynski. We turn north on California, passing by Norris Field, a Little League venue where monk parakeets nest in a cell-phone tower. Crossing 87th we’re back in Chicago’s Ashburn neighborhood, and we soon come to St. Thomas More Church, with a soaring bell tower and a striking bas-relief of the English saint. 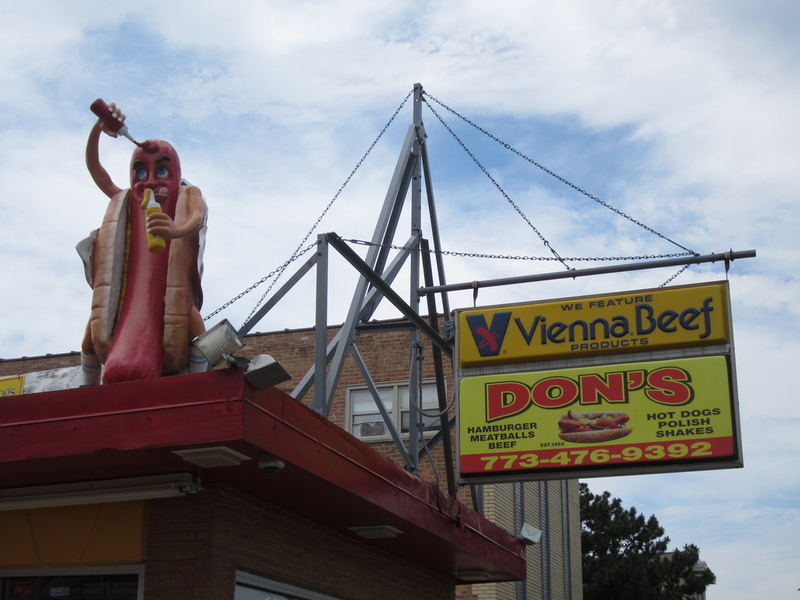 Turning west on 80th, then north on Kedzie we pass by Don’s Hot Dogs, topped by an anthropomorphic fiberglass wiener squirting (ugh!) ketchup on himself. At 71st we enter Marquette Park and cruise the inner drive to the northeast corner where there’s an Art Deco memorial to Stephen Darius and Stanley Girenas, Lithuanian-American aviators who crashed while flying from New York to Kaunas, Lithuania in 1933. Emerging at 37th and Damen, we continue east to Paulina, then north to 35th. We break for lunch at Johnny O’s, 3465 South Morgan, an old-school hotdog stand where Bill buys me a Mother-in-Law, a Chicago-style corn-roll tamale on a hotdog bun with chili. From there we head north on Morgan, passing by a number of hip establishments that Bill views as signs of gentrification: the Co-Prosperity Sphere gallery, Bridgeport Coffee, Pleasant House Bakery and Maria’s Community Bar. Exiting the park we’re at 27th and Halsted and we roll north, then east onto 26th, past Irish-, Italian- and Chinese-American establishments. 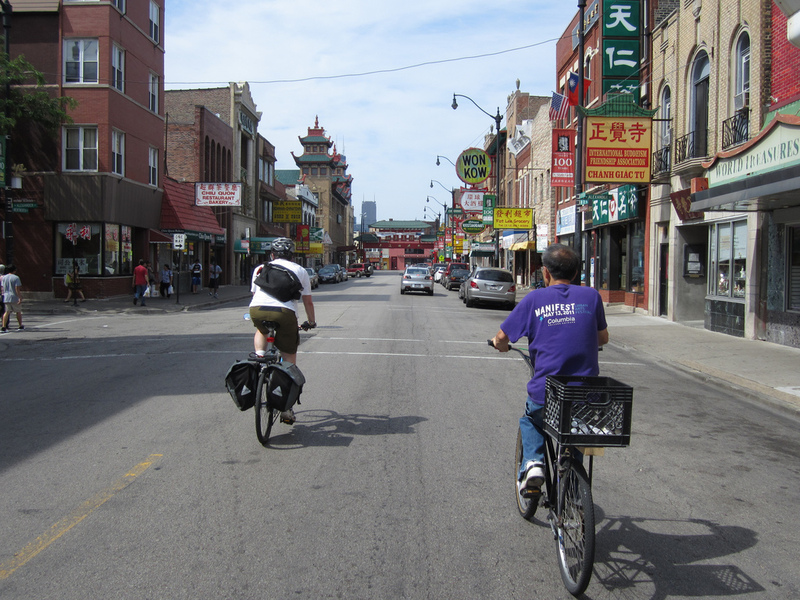 After jogging north on Canal Street, we turn east onto Bill’s “secret route” to Chinatown, a short stretch of 25th Place sandwiched between the Stevenson and the Kennedy Expressway. Rolling north on Wentworth, we come to the red, gold and green signs and pagoda-style roofs of the business strip and overtake an old man pedaling with a milk crate tied to his rear rack. Continuing west on 22nd Place, we visit the Chinese Community Center, 250 West, with a statue of Confucius. Cruising up Princeton, Tan Court and Wells Street, we come to Ping Tom Park, a lovely riverside green space, then head east on 19th. Rolling north on Wentworth then east on 18th, we arrive at the Henry B. Clarke House, 1827 South Indiana, the white clapboard structure that’s Chicago’s oldest surviving home. Bill tells me the house’s watchtower served as a lookout for fires and Indian attacks. We backtrack on 18th to Wabash and pedal north with the steely blue Trump Tower visible in the space at the end of the street. “That used to be emptiness,” Bill says. “Now it’s got a punctuation mark.” We turn west on Roosevelt, broiling as we ride into the late afternoon sun, then take Canal north into the West Loop, relatively deserted because of the holiday. A friend of Bill’s calls to invite him to the Hopleaf bar in Andersonville. We’re in familiar territory now and eager for some cold beverages, so we stop sightseeing and hurry northward. We take Fulton Street, Desplaines and Milwaukee up to Halsted, and zoom through Old Town, Lincoln Park and Lakeview. Cheering erupts as we pass near Wrigley Field, where the Cubs are coming from behind to beat the Padres. We roll west on Lawrence, passing by Uptown music venues like the Aragon Ballroom, The Kinetic Playground, The Riviera and the Green Mill. As we turn north on Magnolia Avenue and ride behind the shuttered Uptown Theatre, Bill points out a spot on the fire escape where peregrine falcons sometimes nest. Heading west on Argyle Street to Clark Street, we soon pull up to the tavern. “Chicago Cycling: What’s New?” panel discussion with Commissioner Gabe Klein, Alderman Danny Solis, Red Bike and Green cofounder Eboni Senai Hawkins, “Urban Flow” author Jeff Kidder, the nature museum’s Steve Sullivan and Newcity’s John Greenfield discussing local bike issues. Thursday, June 21, Peggy Notebaert Nature Museum, 2430 North Cannon Drive, naturemuseum.org, 5:30pm; free. Chainlink Bar Night Meet up with some of the 7,000-plus members of the local bike social networking site for drinks and dinner. Thursday, June 21st, The Spot, 4437 North Broadway, thechainlink.org; 8pm-11pm; free. Hyde Park Kidical Mass This new South Side chapter of the kid-friendly bike ride launches with a fun cruise around the neighborhood on quiet residential streets. Sunday, June 24, 5201 South Hyde Park Boulevard, chicagokidicalmass.org, 10:30am; free. Bikes and Beers for a Bright Tomorrow Show your helmet at this fundraiser for the Academy for Global Citizenship charter school to get a free ticket for the bicycle-centric raffle. Wednesday, June 27, Bar DeVille, 701 North Damen, tinyurl.com/bikesandbeers, 7pm-10pm; free. Chicago Critical Mass Join hundreds of cyclists for this monthly bike parade and demonstration for bike-friendly streets, for a leisurely pedal to a destination yet-to-be-determined. Friday, June 29, Daley Plaza, 50 West Washington, chicagocriticalmass.org, 5:30pm; free. The L.A.T.E. Ride Join up to 10,000 cyclists for this annual after-hours bike ride through North Side neighborhoods and along the lakefront, benefiting the Friends of the Parks advocacy group. 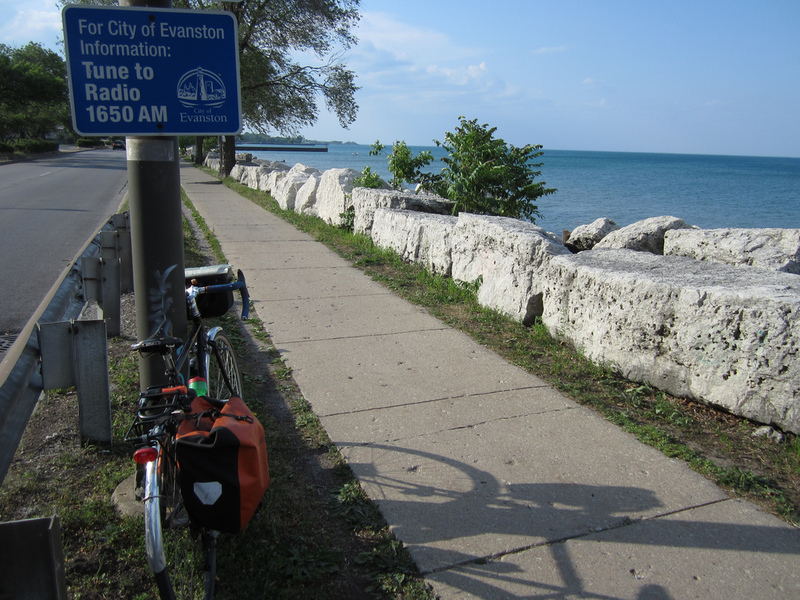 Sunday, July 1, Buckingham Fountain, 500 South Columbus, (773)918-RIDE, lateride.org, 1am; $40-$45.